I am pleased to welcome Debbie Marshall to Great War 100 Reads. I first met Debbie last summer at the Canadian Literature of World War One Conference. (Truth be told, I introduced myself after eavesdropping on a conversation about her blog on WW1 nursing sisters and sensing a kindred spirit on women’s history.) Her book, Give Your Other Vote to the Sister, was quickly added to my reading list. Debbie has kindly agreed to share some reflections about her work. What was the biggest challenge in researching Give Your Other Vote to the Sister? Categories: Biographies, Diaries and Memoirs, Interviews | Tags: Alberta, Debbie Marshall, Nursing Sisters, Roberta MacAdams, Women in WW1, women’s suffrage | Permalink. How does a woman raised in an affluent, urban, middle-class family in the late 1800s and early 1900s become a professional dietitian, travel alone to the other side of a vast country, and work to bring rural women together to improve their collective lives and the farm economy? How does that woman, who sees no need for women to have the vote, become one of the first women elected to public office and an advocate for veterans and their families? Roberta MacAdams was the second woman elected to a legislature in the (then) British Empire. Debbie Marshall recaptures MacAdams’ story for the record in Give Your Other Vote to the Sister: A Woman’s Journey into the Great War. Those who come first are well-documented and remembered … they go down in history. Those who come second are more often forgotten, even though their accomplishments may be just as worthy. MacAdams was born in 1880 and raised in Sarnia, Ontario. Her upbringing destined her to marry and manage her household. Instead, at age 28 she moved to Guelph to study home economics at the Macdonald Institute (now part of the University of Guelph). She moved to Edmonton and found a job teaching “domestic economy” to rural women. She realized that, more than knowledge, they needed the fellowship of other women to fight against an isolated existence. She worked to develop a network of Women’s Institutes across the province, with the backing of the Alberta government. Then she became Superintendent of Domestic Science for the Edmonton Public School Board. In 1916, MacAdams joined the war effort. She was appointed as dietitian for the Ontario Military Hospital in Orpington, Kent. She was the only dietitian ever accepted into the Canadian Army Medical Corps. Records list her as a nursing sister, the only military occupation open to women. Also in 1916, women won the right to vote and to run for public office in Alberta. In an odd exercise of gerrymandering, Albertans serving overseas in the war formed their own constituency to elect two members to the Legislative Assembly. Beatrice Nasmyth, a Canadian journalist and suffragist working in London, convinced a reluctant MacAdams to run in the 1917 election and ran her campaign. Soldiers and Nurses from Alberta!! You will have two votes at the forthcoming Election under the Alberta Military Representation Act. Give one vote to the man of your choice and the other to the sister. She will work not only for your best interests but for those of your wives, mothers, sweethearts, sisters and children after the war. Remember those who have helped you so nobly through the fight. That message and a compelling photo on her campaign poster won MacAdams a seat. MacAdams took her seat in the legislature in February 1918. A strong advocate for veterans’ rehabilitation and reintegration, she became the first woman to introduce a piece of legislation in the British Empire, a bill to incorporate the War Veterans’ Next-of-Kin Association. Finding MacAdams was not an easy task. She did not keep a journal or scrapbook and tossed out letters as soon as she had responded. Marshall pieced together snippets of information from archives and tracked down friends and relatives. With this, she tried to follow MacAdams’ footsteps. She sometimes enters the realm of conjecture, but always on reasonable grounds. Give Your Other Vote to the Sister makes the case for reclaiming our past. Debbie Marshall traces the lives of Canadian nurses killed in WW1 in her blog, Finding the Forty-Seven: Canadian Nurses of the First World War. Well worth spending some time there. Read my interview with author Debbie Marshall. Categories: Biographies, Diaries and Memoirs | Tags: Alberta, Canadian history, Debbie Marshall, Nursing Sisters, Roberta MacAdams, Women in WW1, women’s suffrage | Permalink. We think of monuments being conceived by human minds and wrought by human hands. This monument was wrought by nature. British nurse Edith Cavell was executed on October 12, 1915 for helping Allied soldiers escape occupied Belgium. Mount Edith Cavell in Jasper National Park, Alberta, was named for her in 1916. 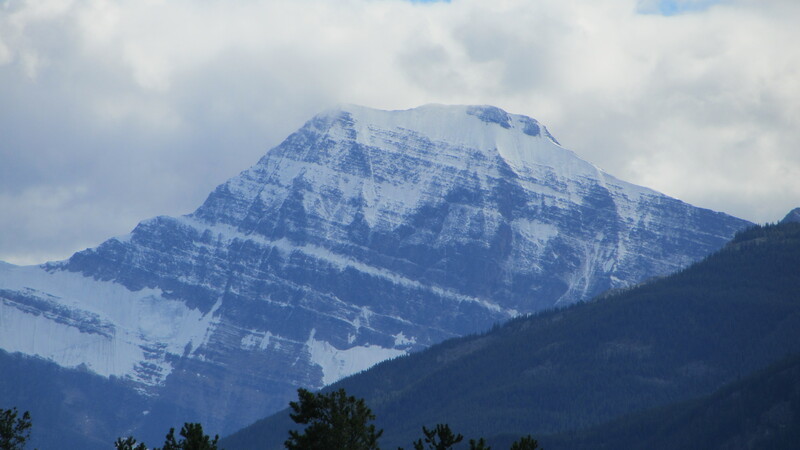 At 3368 metres high, Mount Edith Cavell is one of the dominant peaks at the north end of the Icefields Parkway. A spectacular view on one of the world’s most beautiful drives. 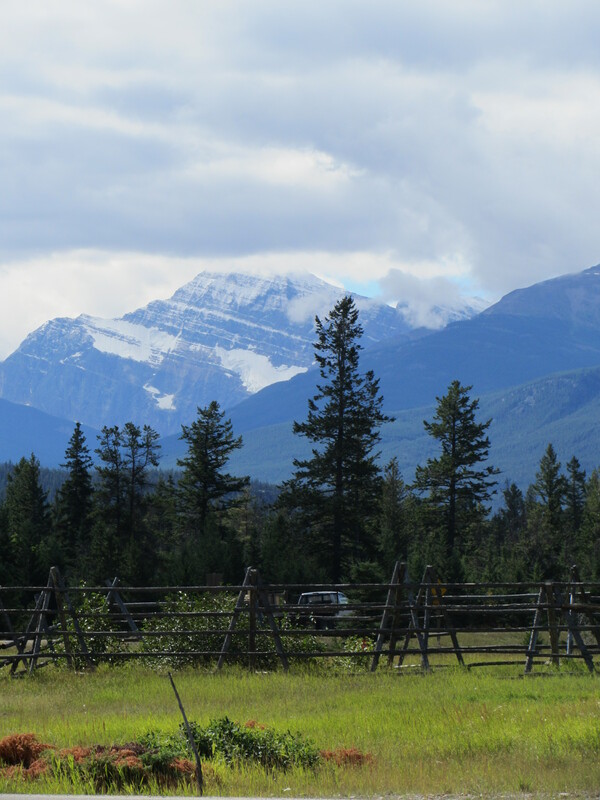 Categories: Monuments and Memorials | Tags: Alberta, Edith Cavell, Jasper National Park, Nursing Sisters, Women in WW1, WW1 memorials | Permalink.